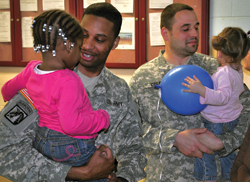 The military is known for developing a sense of camaraderie within their service members. For Andre, Tiara, Paula and Mecca the sense of family and camaraderie is much stronger. And that's because all four serve in the same unit within New Jersey's Air National Guard, and they are all related. Tiara Williamson, and his niece, Airman Paula Daniels. 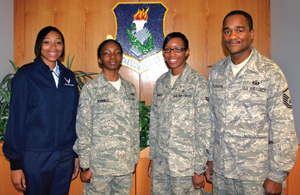 Another niece, Airman Mecca Jennings, stayed behind during the exercise, which was held from March 21 – 25. The Williamson siblings come from a long and rich military tradition that was started by Andre Williamson. He enlisted into the Army 24 years ago, and today he serves with the 108th. "I grew up a military brat," said Tiara Williamson, a public health technician at the 108th Medical Group. So making the choice to also join the Air National Guard was not difficult for Tiara Williamson. Aside from the educational and other benefits she would receive from the military, she also wanted to make her father proud, Tiara Williamson said. And what better way than to serve with the same unit that her Dad is currently serving in. "She made us proud when she made the decision to join this great unit," continued Andre Williamson. Today, Tiara Williamson is a student at Essex County Community College in Newark studying Biology and premed. She plans on transferring to Rutgers University after she completes her associate's degree. As if having his daughter serve in the same unit with him wasn't enough, right behind Tiara Williamson's enlistment into the 108th Wing was her first-cousins, Daniels and Jennings. "It's a family affair," said Tiara Williamson. Although her interest for the military was started by recruiters, having family and familiar faces at the unit is a plus, said Daniels. She thought it would feel weird to be around her family at the unit, said Tiara Williamson, but now she is happy and looks forward to spending more time with her family while training for the upcoming operational readiness inspection. "It's great having my dad give me encouragement and pointers during a training class," said Tiara Williamson. The same can be said for Daniels, since she now has a dual role with her uncle; an Airman and a niece. "I address him as Master Sgt. Williamson," said Daniels. "But once in a while, out of habit I'll call him Uncle Andre." Although they are all in different sections within the 108th and don't see each other much during the day on drill weekend, they continue the family bond that has brought them together. "I have the camaraderie of the military, but I also have the family bond," said Tiara Williamson.